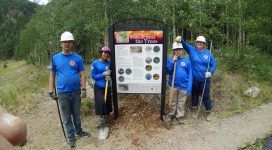 Summer is a busy season at Bandelier National Monument, and Rocky Mountain Youth Corps has recruited and deployed a preservation crew to work alongside park service employees to preserve and protect what is left of the historic pueblos that are the highlight of this unique monument. 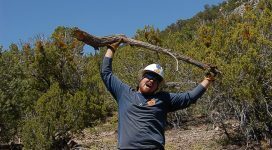 From graffiti and litter removal in the numerous caves found in the park, to dismantling and restoring intricate pueblo walls to increase structural longevity, this crew has had a summer full of cultural and field work experiences. Apart from having the opportunity to participate in cultural traditions such as feast day in multiple pueblos, and other educational activities such as bird banding and hikes with the park service, the crew has also participated in the data recording process as they’ve worked to stabilize the walls of the Tyuonyi Pueblo. Every room in the pueblo is mapped and photographed before, during, and after they rebuild the walls. The crew uses a sand/silt/clay mortar that they’ve been taught to mix themselves. In this photograph, Rocky Mountain Youth Corps members are shown mentoring young people from the Student Conservation Association about the careful process of maintaining the pueblo walls. The Bandelier Preservation crew proudly continues to work together to strengthen the foundation of the park to ensure that the rich history of the park will thrive for generations to come. See our Facebook page for more photos and for current updates.